The EVVA 3KSplus is one of the most secure Master Key systems available in Australia. It is ideal for organisations requiring a locking system with a large number of different user groups such as universities, cultural and leisure centres, shopping centres, retail chains and industrial companies. The system offers comprehensive extension capabilities without compromising the level of security. The unique rounded tip on this reversible key makes the 3KSplus key particularly easy to use. Made from high quality nickel-silver alloy, the anti-friction coating of all locking elements and the springless technology of the 3KSplus plug guarantee high wear resistance even under the toughest conditions. The unique overlapping curve millings of the key prevents key duplication or manipulation within the locking system. 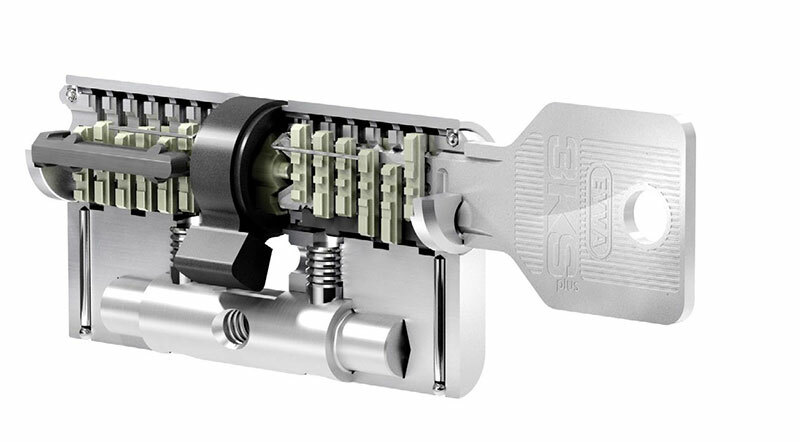 Unlike conventional locking systems that confirm a single check when the key is engaged, the locking elements in the 3KSplus cylinder move along curves on the key, meaning the key is scanned four times during the locking action, providing enhanced protection. The curves, combined with the springless locking pin function, guarantees pick resistance and durability. Manufactured in Vienna, Austria, EVVA’s reputation for technologically superior locking systems is unmatched, and the 3KSplus leads the way in resistance against commonly used break-in methods, and includes enhancements that hinder illegal production of duplicate keys even further. The 3KSplus cylinder is produced in modular version (SYMO) and can be adapted to specific door variations and customised with specific functions such as external key override directly on-site, saving you time and money. As a market leading product, 3KSplus cylinders comply with EN 1303: 2008 in lock security class 6 and attack resistance class 2. They are suitable for EI 30 and E 30 fire and smoke control doors as standard. Mechanical locking systems are the foundation of organisational building security. A combination of electronically controlled security technology creates all-encompassing security solutions. Integration through electronic identification technologies. 3KSplus keys can be designed as Combi Keys that carry identification technology (e.g. Mifare, Legic, iButton etc.). This transforms the mechanical key into an electronic ID. Motorised cylinder. Motorised cylinders can be integrated into a 3KSplus master key system. These cylinders can be locked and unlocked with an electronically powered motorised knob. Combining the 3KSplus locking system with an electronic locking system. Very often mechanical locking systems are used in combination with electronic access controls. This means that all different types of door can be equipped with suitable security technology, according to their specific level of protection required. Mechanical emergency lock for electronic locking systems. Due to the robustness and stability of mechanical locking systems, they are often required for use in emergency service buildings (e.g. fire brigade) as mechanical emergency locks (overlocks) for electronic systems. The EVVA 3Ksplus is perfect for this application. Emergency opening with BSZ dual sided lock function. A locking cylinder can be blocked from functioning when a key is inserted in the lock. This can pose a safety hazard, particularly in the event of an emergency. What can be done, for instance, if a member of your family or a hotel guest always leaves their key in the lock on the inside and there is an emergency? The solution: EVVA/Aldridge double cylinders can be optionally fitted with a BSZ function. BSZ is a function which allows the cylinder to be locked from both sides, even if an authorised key is inserted on one side of the door. Emergency opening with override function. In the event of an emergency, controlled access to all rooms must be possible at all times, particularly in companies. EVVA/Aldridge offers the option of a so-called lock override: This is when a person with an authorised key can take the locking system general master key (GMK) or group key in a controlled way and thus have access in the event of an emergency. The general master key must also be available to emergency services such as the fire service in the event of a fire or other emergency. The key can be securely stored in an EVVA/Aldridge tubular safe. Our unique, patented pinning system and sidebar system makes EVVA an extremely secure security option. We would be happy to provide additional technical information upon inquiry and demonstrate the system’s features and benefits upon request. Simply contact us on 0404 804 444 for further details. Phone us on 0404 804 444 to get more information and a quote.